What exactly does it mean to be blank? To be devoid of words, of meaning, or merely a sense of being? Note that this paper does not proclaim its blankness. This state (or is it something more insidious/noble/politically correct? An imposed identity? A unwelcome sense of purpose? A sanctioned grade accorded in line with some higher corporate purpose to keep the grand machinery in fluid movement?) is forced upon it, printed in 24-point Ariel font for all to see. Yet does it cease to be blank once these 5 words are branded on its fibres, interwoven in its very psyche? Or will it always be deemed blank, just to avoid having the hapless student make the error of thinking that they, out of the whole cohort, have been singled out for a printing mistake that has erased the questions that would have, could have or might have determined that rosy future that their parents have aspired for them? It sits between pages of questions that will be read, re-read, underlined, highlighted, scribbled on, and then marked, re-marked, and commented on again and again. It sits, having a purpose that is a non-purpose, a blankness that is empty, void and yet full. A blank page. This is a blank page. This is a blank page. 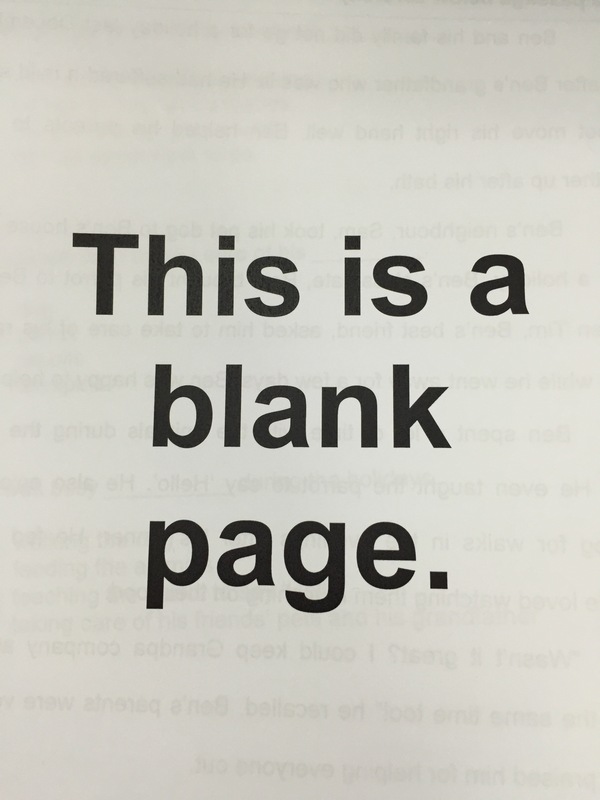 This is a blank page.